History was made on the morning of St David’s Day 2017, when twenty-five Founder Members drawn from the Colonnade Club gathered together with a team of Consecrating Officers from the Provincial Grand Chapter of South Wales to consecrate the Colonnade Chapter No 7305. The ceremony got underway at 10.30 a.m. when the Consecrating Officers, led by the Most Excellent Grand Superintendent, E Comp. David Westall, processed into the Duke of Connaught Temple in Cardiff Masonic Hall. The ME Grand Superintendent was ably assisted in carrying out the impeccable ceremony by the Deputy Grand Superintendent, E Comp P. Colin Weatherall, PGSwdB; the 2nd Provincial Grand Principal, E Comp Marc Lewis, PGStB; and the 3rd Provincial Grand Principal, E Comp David J. Suter, PGStB. The Lodge of Benevolence No 7305 – the Grand Officer’s Lodge in the Province – sponsored the Chapter, which will be made up primarily of Brethren affiliated to the Colonnade Club – the Club for new and young Freemasons in the Province of South Wales. The consecration of a new Lodge or Chapter is always a very special and emotional event, representing the culmination of hard work and a shared vision, but this occasion was particularly unique in that it involved a very senior ruler in Royal Arch Masonry: Most Excellent Companion Gareth Jones, OBE, 3rd Grand Principal of the Supreme Grand Chapter of England, and Provincial Grand Master for South Wales, was Installed as the Chapter’s Primus First Principal. ME Comp Gareth has served as the President of the Colonnade Club since its launch in 2015, and his willingness to honour the Colonnade Chapter by taking office is much appreciated by the Companions and members of the Club. E Comp Roy Woodward, PGStB – ruling Master of the Lodge of Benevolence No 7305 and Deputy Provincial Grand Master for South Wales – was installed as the Chapter’s Primus Second Principal, whilst E Comp Ben Gait – inaugural Chairman of the Colonnade Club – was installed as Primus Third Principal. Over one hundred and fifty Companions witnessed the consecration, with one hundred and forty remaining for the Festive Board, where they enjoyed a Welsh themed menu of Welsh rarebit, roast leg of lamb, topped off by bara brith pudding and ice cream. 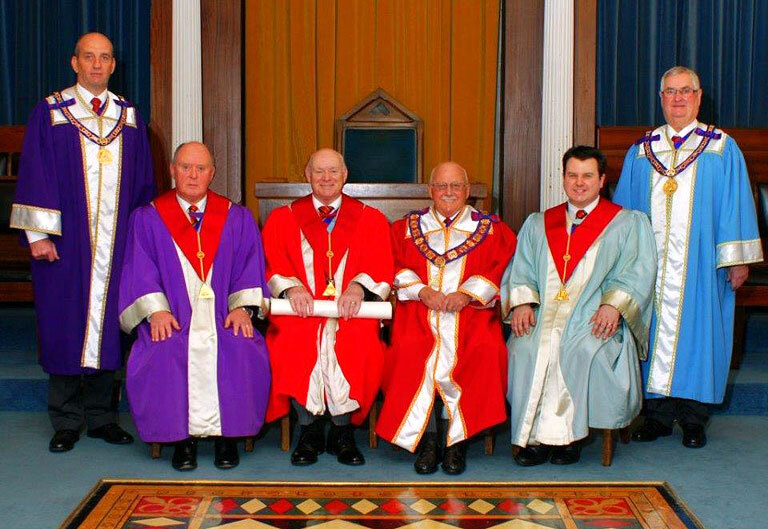 Forty Officers of Supreme Grand Chapter were present, and thirty-seven officers of Provincial Grand Chapter. In his toast to Supreme Grand Chapter, E Comp Ben Gait noted that the consecration was taking place exactly two years after the launch of the Colonnade Club on St David’s Day 2015. He also paid tribute to ME Comp Gareth Jones for his constant support of the Club and his recent appointment as the United Grand Lodge of England’s lead for the New & Young Masons’ Clubs movement across England & Wales. In his response, the 3rd Grand Principal emphasised that history really was being made with the founding of the Chapter. He pointed out that the new Chapter will not just bring together new and young Masons from across the Province of South Wales, but will serve as an example to other New & Young Masons’ Clubs right across the Constitution, and the senior rulers in both the Royal Arch and the Craft would be watching the Chapter’s progress with great interest. In his response to the toast to Provincial Grand Chapter the ME Grand Superintendent stated what a privilege it had been to be able to consecrate this special Chapter, and thanked all of his Consecrating Officers, who had worked so hard to set the standard and make the ceremony a profound and meaningful experience for all involved. The festivities are likely to be remembered for a long time to come. This entry was posted on Tuesday, March 7th, 2017 at 11:58 am	and is filed under Colonnade Club, News, RA News.